Have you ever gone somewhere and instantly wondered what you were doing there? That’s how I felt at the dinosaur museum in the provincial town of Savannakhet, Laos. Sitting just across the Mekong from Thailand, Savannakhet seems like an odd location for a dinosaur museum. After all, despite being the second largest city in Laos, Savannakhet isn’t a major tourist destination or cultural hub. Most travelers to the city are simply passing through, rarely going further than the bus depot on the town’s outskirts, hopping on the next bus to one of the region’s more established destinations. 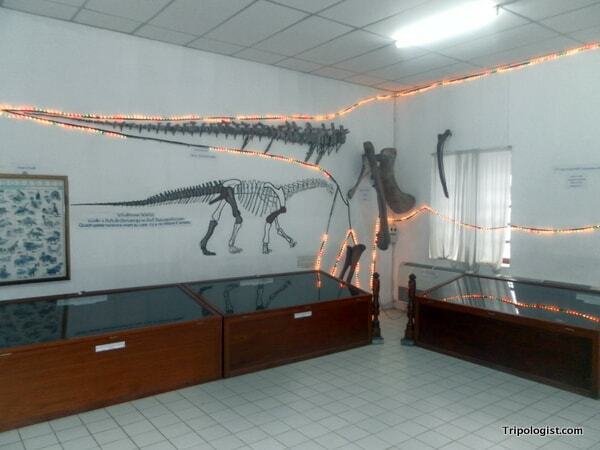 However, the origins of Savannakhet’s Dinosaur Museum makes sense once you consider the areas history. Dinosaur fossils were first found in the province in 1936 by French archeologist Josue Hoffet; however it wasn’t until the early 1990s that a concerted Laos-French effort was mounted to documents the region’s fossils. Throughout the province, fossils have been found in five different locations, though no excavations have occurred since 2000. In their absence however, Savannakhet’s tiny museum was established. Ever since I was a kid, I’ve liked dinosaurs. So, when I saw in my trusty copy of Lonely Planet Laos that there was a dinosaur museum tucked away near the river, I was intrigued. Housed in a dilapidated building close to the might Mekong, the Savannakhet Dinosaur Museum looks impressive from the outside. Wondering up the gates, we found the front door locked. While pondering what to do, we were greeted by the friendly attendant who happily unlocked the door for us and charged us the standard 5,000 Kip (about $0.60) admission fee. Before entering, we were given a brief introduction in English, and the curator turned on the lights, including some awesome rope lights straight from a college dorm room, before leaving us to our own devices. The exterior of the Savannakhet Dinosaur Museum should have been our first indication that visiting was a mistake. The museum itself consists of two average-size rooms skirted with display cases. Unfortunately, though, nearly all the signage was written only in French and Laos, making it difficult to appreciate what we were seeing. Had we spoken one of these languages, I’m sure the museum would have been more interesting. Despite the inability to read most of the signs, I did uncover one interesting factoid: most of the bones in the museum aren’t really bones at all; they are just replicas of the fossils that were found in the area. I found this to be quite disappointing. I do have to applaud the local officials for trying, though. After all, when I think of dinosaur museums, prestigious institutions like the Smithsonian come to mind, not a small dilapidated building in central Laos. However, don’t make the same mistake that I did. 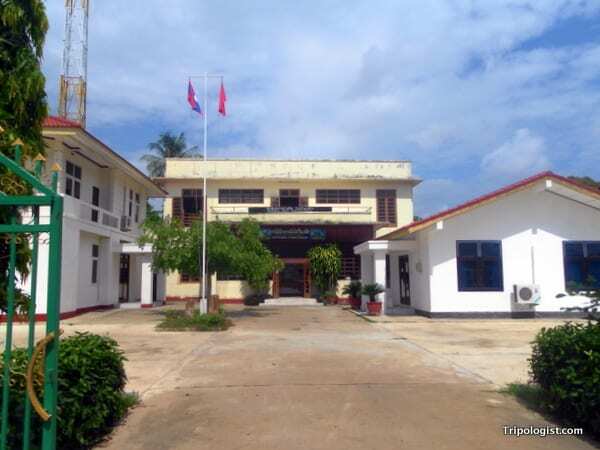 While it may be a quirky attraction to see if you are already in the town, the Savannakhet Dinosaur Museum is definitely not worth the stopover. That being said, if you are already planning to visit the city, the novelty factor alone makes the museum worthwhile. 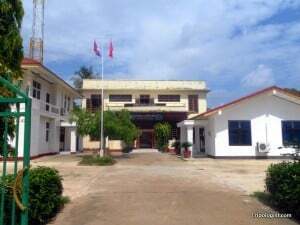 The Savannakhet Dinosaur Museum is located across from the Thai consulate near the Mekong River. It is generally open from 8am – 6pm with an hour off for lunch in the middle. Where have you gone that you instantly wondered why you were there? Let us know in the comments below. Oh dear. I once went to a communist museum in Poland that was a bit like this. Didn’t really have much information and I wish we hadn’t bothered! Have you been to the Natural History Museum in London? Now that is a good dinosaur exhibit! Oh dear, I just saw this title and had to check it out. Never would have expected a dinosaur museum in Laos-good for you for even checking it out! Getting dragged into a jewelery shop in Bangkok springs to mind. A common trick from the tuk tuk drivers is to usher tourists into them half way through your journey for various reasons, be it for family members, fuel tokens, whatever. My first morning in the city and my first tuk tuk ride and here I was pretending to be interested in buying and looking at rings. I certainly did think: Why the hell am I here and how did this happen? I didn’t even end up where I wanted to be – I jumped out later as my patience was being tested. “Just two more stores” my driver said. No thanks. Taxi! Bangkok tuk tuk drivers are pretty bad. So bad, in fact, that I avoided them all together. While I loved taking tuk tuks in many other cities around Asia, I only rode in licensed taxis in Bangkok. Didn’t want to end up in any jewelry shops. 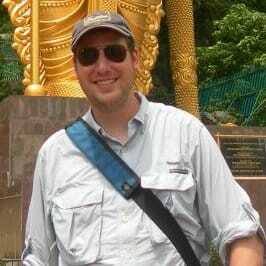 I mainly only took Tuk Tuks in Laos and Cambodia and my Lao wife was usually with me so no problems. the one time I did take a Tuk Tuk in Bangkok, I told the driver exactly where I wanting to go, in Thai, and sternly told him “no where else”. may have helped that I am 250lbs and look like a serial killer (so I’ve been told). seems like though it they know you’re a tourist, they try to take advantage. if they think you are an expat or someone who is wise to the ways, they don’t bother you much. Sounds like a freak show at a circus. Glad the rest of the temple was worth it though. As a Laos expat I couldn’t agree with you more. It is so disappointing to visit the place because the region is really quite a major dinosaur site. Have you visited the Dinosaur Museum in the Kon Kaen region at Phu Wiang over in Thailand. While it is no Smithsonian it is quite modern with contemporary display and conference facillities. They have an extensive interactive Hall and great specimen preparation laboratory.. The excavation sites are nearby. You’re right. The area around Savannakhet has many dinosaur sites. They really should have a quality museum in the city, or at least in Vientiane. Thanks for the museum recommendation in Thailand. Didn’t have a chance to visit that one when I was in the area, but I’ll try and go the next time I visit the region. Say too much then why don’t you invest something here then. Whose idea was the dinosaur come about? We know craps about it. If you’re an expert then do something about it to make it better or what not criticising other countries’ development. I have to disagree with this review, having recently visited the museum. Its pretty much as you describe, however when I went the retired chief dino digger was giving tours of the place for free. I initially had the same feeling of disappointment looking at all the labeling and information, however before long our guide was telling us stories about how he found this fossil and that, all in an almost incomprehensible french accent. Then he started opening drawers and giving us actual original dinosaur fossils (not replicas) to handle and have photos with. Nowhere else I know where you can do that. Crowning moment was getting to go out the back and see the team building a full replica of their main exhibit for an exhibition in Japan. Obviously no guarantee that anyone else will get the same experience, but I’d just suggest don’t write off the museum if you happen to be in Savannakhet. Having lived in Savannakhet for 5 and a half years we can attest to the fact that the curator of the museum regularly gives free private tours and gets a kick out of handing you a fossil and saying, this is 65 million years old! Admittedly I wouldn’t travel to Savannahket for the specific purpose of going to this museum but in it’s own eccentric way the Savannakhet dinosaur museum is one of those rare South East Asian communist gems, and the curator really has done a fantastic job with not a lot resources. Definitely has it’s own charm! In fact it is probably the only museum in Laos that actually has any scientific value whatsoever! Totally worth the 5000 kip (65 cents) entry! !